Beyonce (Motha as I call her) is gearing up to give an epic Superbowl performance, and her fans are anxiously awaiting her new documentary Life is But a Dream set to air on HBO on February 16th. SEE ALSO: Beyonce Shows Blue Ivy's Sonogram in Life is But a Dream Trailer!!! 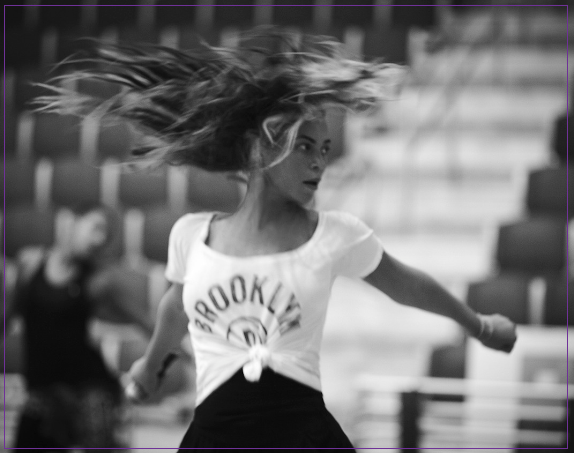 While we all wait for our next encounter with the global hot mama, we have some brand new exclusive photos of Beyonce in rehearsal that were just released on her site.Out of all of the beautiful black and white photos posted the above one is my favorite. It captures a move we all have come to know and even imitate from one of our favorite Beyonce/Jay Z collaborations. So, I figured why not post it and have you tell me what it is Bey is rehearsing in this picture!! SO excited for this performance AND her documentary! Caption this picture! uh oh uh oh uhohannana lol!